Buying gifts can be hard. In fact, it can be dreadful especially if you are buying a gift for the person who has everything. Personalized gifts can make gift giving a lot easier too. So if you are on the look out for a unique gift for Christmas, Birthdays, etc.. then I’ve got the perfect gift guide for you. I’ve put together 10 Unique Personalized Gifts that anyone would love! 2. Custom Scrabble Game – This design lets you add photos and text, but there are so many other designs too. 4.) 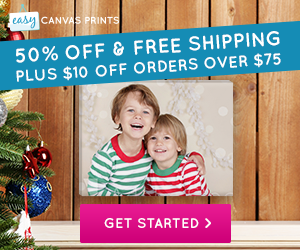 Canvas Photos -Right now there is a amazing deals going on, so just choose your photo and upload. 6.) Online Classes from Craftsy – Customize it for your recipient. (For example, if you have a mom who like to bakes you could get her an online cake decorating class). 7.) Embossing Stamps – I like this option more than labels because you can stamp birthday card envelopes, Christmas cards etc.. 9.) Magic Photo Mugs… Picture appears when the mug has a hot beverage in it. 10.) Cutting Board – Choose from several different designs. Which of these 10 unique personalized gifts is your favorite? Comment below.